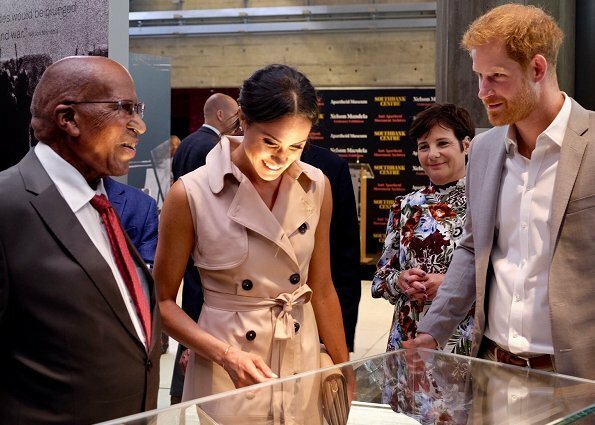 On July 17, 2018, Prince Harry, Duke of Sussex and Meghan, Duchess of Sussex visited the Nelson Mandela Centenary Exhibition at the Queen Elizabeth Hall in London. This exhibition explores the life and times of Nelson Rolihlahla Mandela (1918 – 2013) and marks the centenary of his birth. 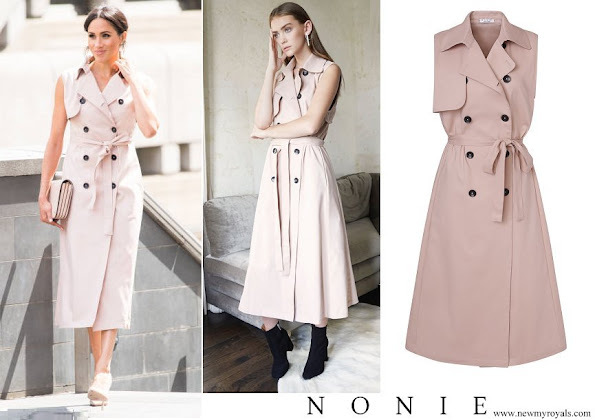 (Meghan Markle is wearing sleeveless trench coat from House of Nonie, a Canadian-based luxury fashion label). I like the dress, her little bit messy bun, and her beautiful smile. I also like that she remained true to herself and not trying to be a copy of Catherine, but has her own style. Well done Meghan! Agree, she looks beautiful, very charming smile. 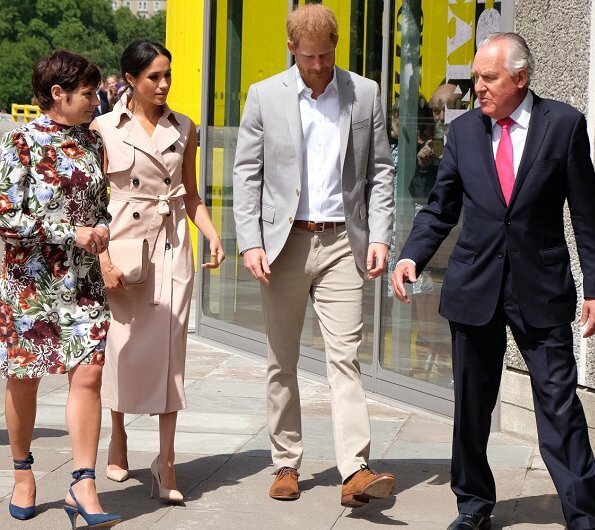 Nice dress in Meghan's style, suits her well. Big no for the shoes, to big and wide once again.. The Queen has women who prewear her new shoes to break them in for her. Meghan sizes up so she does not get blisters. That is not unheard of, and certainly more affordable than having paid women to break in new shoes. I have not heard what Kate does. I am not sure what makes you think her shoes are too wide. I do know if hey were as big as implied, they would fall off her feet when she was walking. 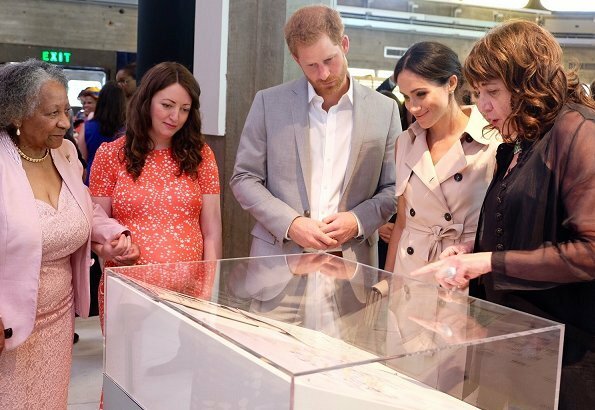 Pink dress is far too big to Meghan. It can be,that when she picks her clothes self, they are always too big. Example the blue-white dress she wore as a wedding guest, was enourmous. The collar is popped a little. It helps frame the face. Why is this a problem? It must be an age thing but I cannot see the point in a sleeveless trench. No criticism of Meghan who looks as good in it as anyone can. She also looks happier here and less unsure of herself than she did at Wimbledon. Harry still looks far less carefree and fun than he used to. I thought in a less formal setting, we might see him back to his smiley self. I'd like to add to that, I don't understand the open toed boots and "shooties" I've seen. I mean, really? Too cold to wear in the winter - not mention getting your toes wet with the rain and snow - and too hot to wear in the summer. Just ridiculous. Are designers really that hard up to think of something new and unique? I am not sure where you are from, but ankle boots are not new. And not everyone lives in severe weather. I'm from the US and I know ankle boots are not new and I'm also old enough to know that "ankle boots" with the toe cut out are! They didn't show up until a few years ago. And imo they are ridiculous! Even in the warm weather of California, where I live, they don't make much sense - as function ***or*** as a fashion statement. JMO! It may be an age thing with me too but the notion of a sleeveless trench looks very silly to me. I don't think that the dress is too big, but that it has too much volume for her frame in a fabric that is necessarily too thick to flow well. It would have been interesting to see if in a softer silk. I don't like the shows (which are indeed too large for her) and the messy bun is a problem for me. It looks unprofessional. I agree about Harry's less carefree stance. 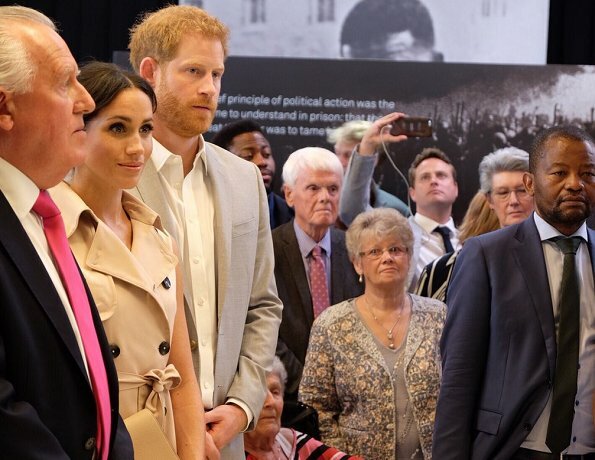 In pictures and particularly in videos of his appearances he looks nervous--perhaps concern about how she's feeling and having to learn how to share the stage. I think it fits her quite well and is adequate for the occasion. It confirms her choices for semi informal clothing style. It would not be my choice neither, but ok for her. Ok for women who can change their clothes on a very fast basis. I don't think it is too big for her. 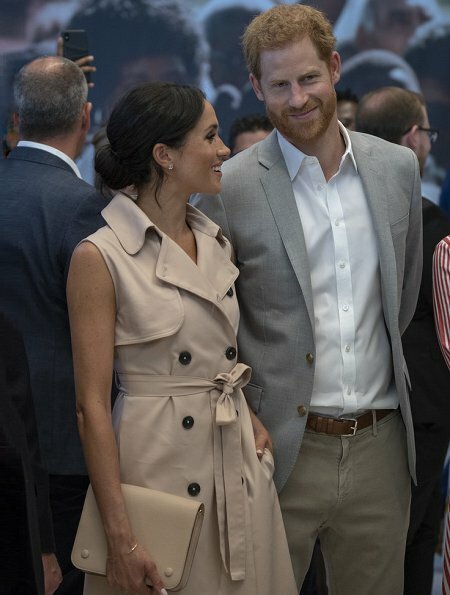 I dont like the dress but hairstyle is very good on Meghan. It suits her. And i like that Harry wear light suit. Sehr schick! Ich liebe ihren sportlichen Stil und ich mag auch ihre sehr viel kritisierten Haare. Nur weiter so, Meghan! What is that extra placket/collar on the one side? I agree with Anne-Minni. It's just too bulky for her frame. I'm sorry but I do not like this outfit. IMHO it doesn't suits her and it makes her look older. Also a trenchcoat is a trenchcoat and a dress is a dress. Nothing good comes out, if you mix it. 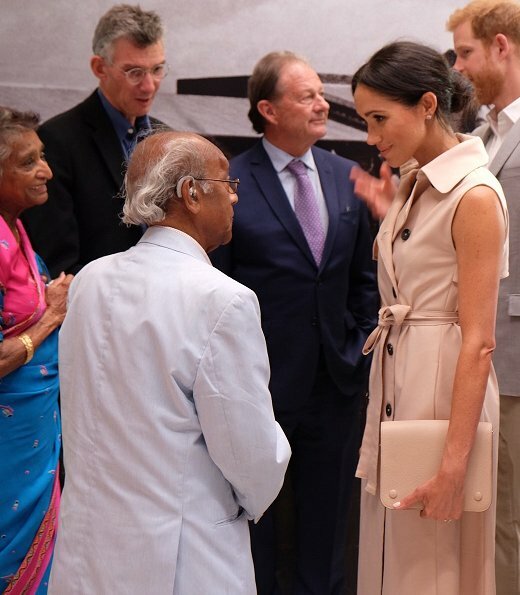 Meghan may be a great woman, but it bothers me that she does not care about the royal rules. Stockings, little handbags and so on.....for me and I speak only for me, these little things makes the special magic and the difference of royals to clebreties. Without they are just celebrities. Your comment is rather philosophical, but I don't agree with you. If she abandons her style (yes of a celebrity, that is what she is actually) she would no longer be herself. Moving to another style in harmony probably takes years. But she is not a future queen, she can just go on, providing us some mostly pleasant estonishment when we see her. We will hear sooner or later what British people think . Royal rules is about caring and helping people. Not about putting on the stockings. Did anyone hear that? That was my eyes rolling in the back of head at this ridiculous comment. Read real royal sources and not the tabloids. Queen Letizia does not always wear stockings and will many times carry a larger purse or satchel when attending meetings of business. She is the image of a more modern queen. Diane, 😂😂😂😂😂 never ceases to amaze me how people make statements about rules or protocol without any knowledge of such. It's OK, not to like an outfit and to say so, but please don't make stuff up just to find a reason to criticize this woman. As for all that speculation about Harry's feelings, really!! You all can deduct all that by looking at some pictures? About the outfit... I find it chic and original, not my favorite, but definite better than most Royals any day. Anonymus, totally agree. The Spanish Royal Court is a very high-principled House but Queen Letizia shows that old stringent traditions are going together with a young stylish and modern Royalty very well. And IMO this is the right way in tis time and future. A little bit more relaxing of fashion regulation for the younger generation of Royal members combined with a centuries long consolidated tradition that's it what our generation will see. Exactly! She is not breaking any rules. Nor is she dressing like a celebrity. I suggest a little research in both areas before making such bold statements. She looks fine (not my fav either but not awful). So many pay too much attention to the Daily Mail People US Insider all these are tabloid garbage. People is the better of them though. She is not breaking rules. Some od those "alleged rules" do not even exist except in the minds of those who love the tabloid gossip and those that are hell bent in bashing her every time she appears. 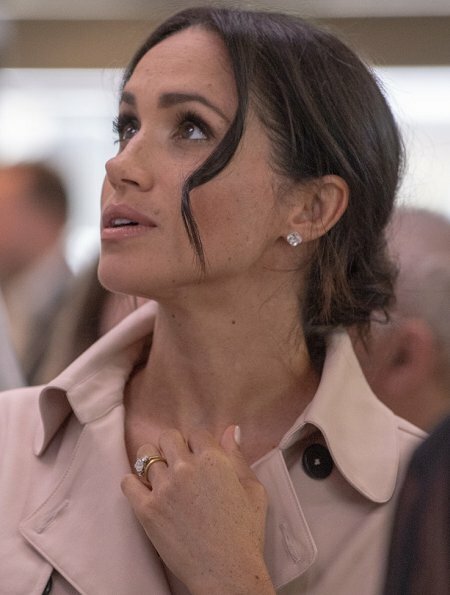 Too long too short not tailored messy hair those purses touches her hair clingy.....good grief she probably breathes too loudly for some 😡 Meghan has always been a classy lady. I am quite sure she has been schooled in the do's and don'ts. 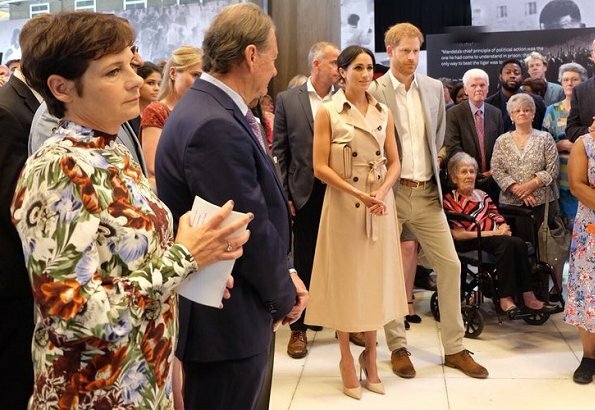 Catherine has not always worn hose at every event either. I think when it is an event with the Queen or something that requires respect they do and are supposed to wear them. Otherwise it is not an issue. Diana did not wear hose all the time either. Good grief the first time Meghan wore them so many made comments about the shade. She cannot win because they want to rip her apart, they want her to stumble and fail. We should all be cheering for her as women. Her load is quite heavy I am sure. Especially with that despicable family sans Doria. Nice to see mature womens wear which can be wore of women until 50+. Please, what hairstyle? That is not a messy bun. That Is unbrushed hair. Photos #3, #9 and #10 look like hair that was put up quickly to go into a bath. She needs a hairbrush. And yes, she is a beautiful woman but she never wore shuch a disheveled look in “Suits”. Meghan has great arms and it’s hot in the UK right now. The only thing I don’t care for is the messy bun with hair tendrils tucked behind her ears. 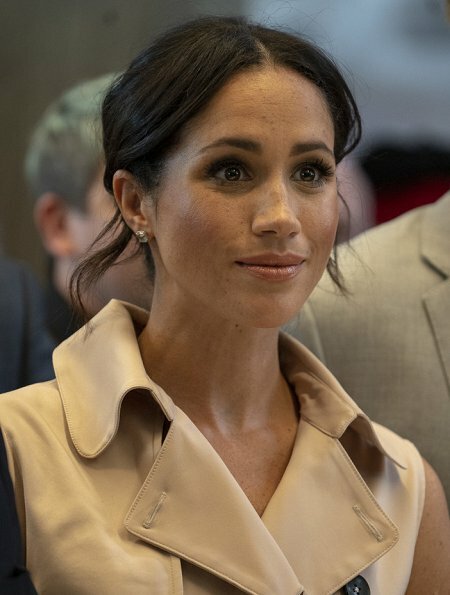 A lovely look from Meghan - love the dress and accessories and the soft styling of her hair. Megan heeft heel magere benen zonder vorm(kieken-benen) en misschien zijn haar voeten ook zo smal zodat de schoenen de indruk geven te groot te zijn.Trench vind ik nu ook niet voor een zomer weertje. I thought someone was working with her to advise. Either it is not working or she is not listening. DofC always looks spot on. Did she have an advisor or is she just a more polished person? How much did this one cost Charles? 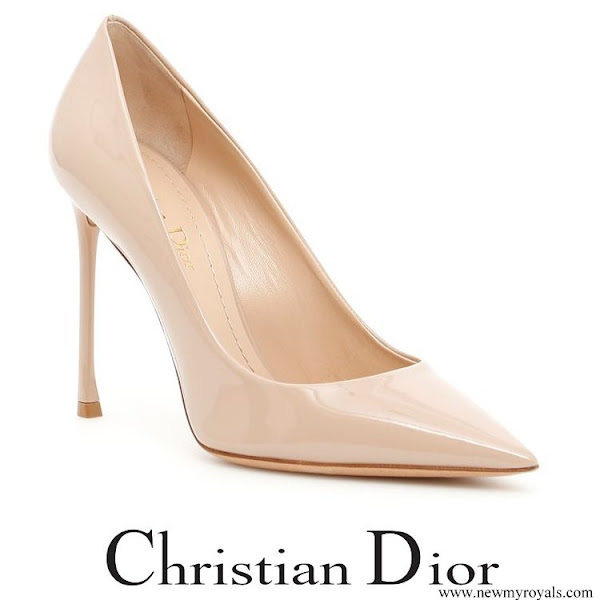 Perfect combination of professional and feminine. Modified sleeveless trench is genius. England is having a very hot summer so this is a practical choice for comfort, as well. I like the dress but I think it overwhelms her small frame. It is fine until it hits below her waist. I think it could have been tailored a little. But she looks beautiful! I love the messy bun! She doesn't look terrified to me ~ even though that Father of hers is non stop looking for his 15 minutes. He is ridiculous. She must be under stress with him STILL. He needs to shut up. Your side note is appreciated. The only member of her family who has not sold information about her to the highest bidder is her mother. If my family behaved this way, I would be devastated. I give Meghan full credit for the grace she shows in public. Her father's and family's comments are unhelpful and unwelcome. With their every word, they prove that she is right to cease contact with them. True daddy needs to be quiet and let his daughter find her path. 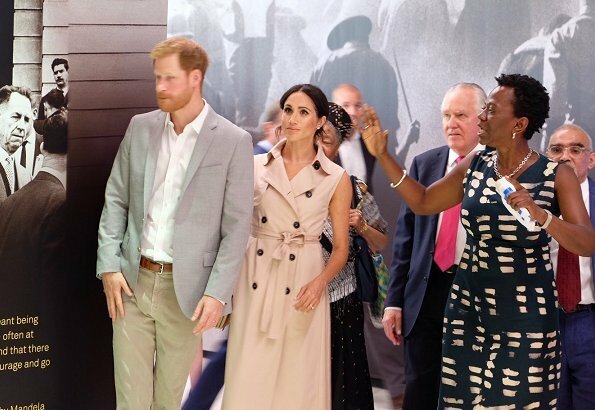 However, Diane before Harry she had a strong personality; deep political views, feminist, UN ambassador...In her role as Duchess she cannot express those views, she has to step back and follow Harry. I imagine this can be a bit boring for her, so maybe that's why people here commented before that she looks miles away. I am sure it is overwhelming at times. But she what she was signing up for here. I was referring to her Dad who keeps getting paid for his thoughts on her and the family. He is a despicable person. Now I totally get why she is only close to her Mom. Hope Duchess Meghans mother is not reading this blog. A sleeveless trench coat. Why? Messy hair again. Actually this is a coat and that is why it looks big on her. Coats are sized bigger because other clothes are worn with them underneath, like dresses, blouses, pants, skirts, etc. It looks like she does have a dress underneath that is the same color as the coat. This is not a coat. It is a dress. It is apparent that any clothing style "out of the ordinary" is just too much for some people. 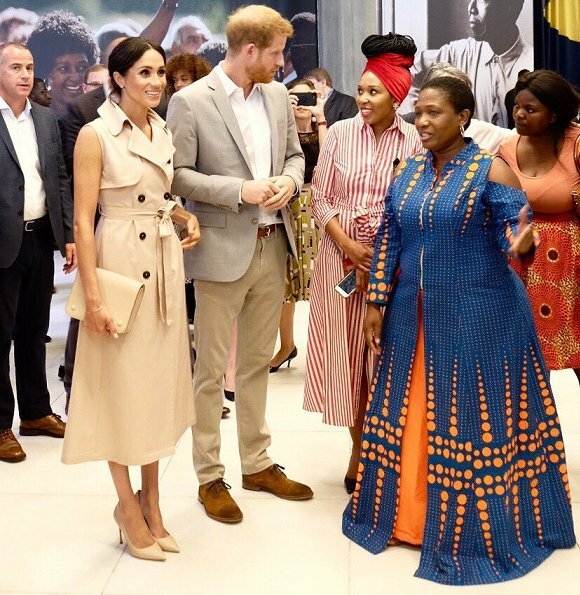 Meghan's wardrobe does not come across as a "uniform" the way the Queen's or Kate's wardrobes do. In other words, her choices are not as safe. It is not wrong, but refreshing. It just seems to make some people angry that prefer a more conservative look. Highly agree with your thoughts.. I feel for her. They are both suffering, that's clear to see. The RF PR department is not doing a good job. It must be terrible to have a Dad and a Sister and Brother who are so dysfunctional. No wonder M & H do not feel happy and gay. MM is doing the best she can and Harry tries to deal with it all. It shows once more that members of the BRF are not in touch with the real life. Under these nerve wrecking circomstances MM has other worries than how to dress and finding her own style. I think she looks lovely and wish her all the best! Good point. People say that Harry doesn't look comfortable and that's probably because he's uncomfortable with all the criticism his new wife has received. If she puts a foot wrong it'll be headline news. Meghan seems to have tough skin though. Hope things get easier and her family shuts up. I feel a wee bit sorry for Mr Markle. He's certainly an embarrassment and it would be better all round if he just kept his opinions to himself, not to mention the nonsense of he doesn't know how to contact her. I suggest Duchess of Sussex, Kensington Palace, London would probably do it! Equally, could she not pick up the phone and say "Look, Dad, you are really doing me no favours here. If you really do love me, as you've always told me, please don't give any more interviews to the press"Not sure that Meghan and possibly Harry should hop on a plane and call to see him. I'm sorry but I can't see how the fact that Mr M is giving random interviews indicates that the royals are out of touch. Oh, AnnieM, I wish this would work. But it won't. It would only feed the narcissistic behavior. It would never end. The next headline he would sell would be, "Meghan called me! She begged me not to talk to the press but I want to share my happiness." And then more money. Tom Markle has proven to be untrustworthy. Meghan and Harry cannot trust him with a single word. It is better to completely disengage. Right now, her father is committing emotional blackmail and threatening his own daughter: "talk to me, or else." It is disgusting. No contact is the only way. How somebody treats you is how he feels about you. 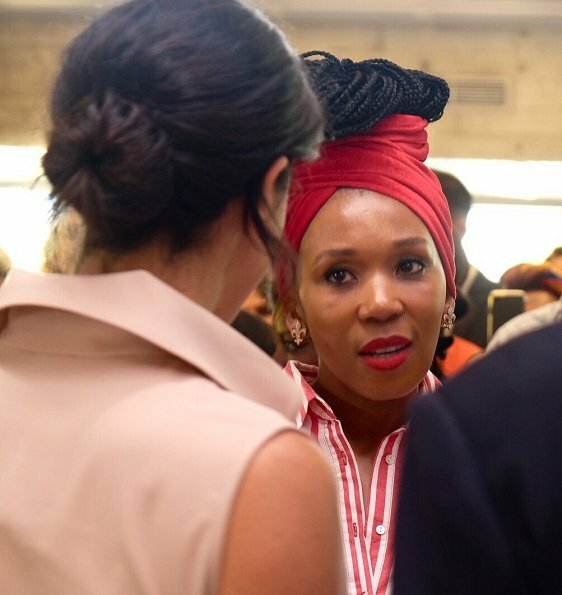 If Meghan has any sense, she'll adopt the RF motto, 'never complain and never explain'. Her father and vile half sister will soon have very little to moan about, and hopefully the press will stop giving them a platform to spew their opinions. Dear Anon 1:06 and Pine thank you for open words. In truth they cannot actually love others. She looks beautifully chic. She has adjusted the Nonie-design, taking the flared skirt in, which I love. 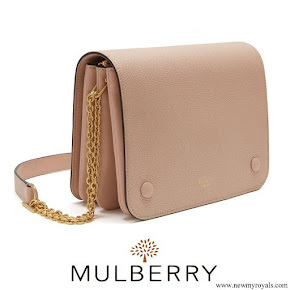 It affords her a simpler, sleek, elegant silhouette. I agree. She knows her body and how to wear clothes. 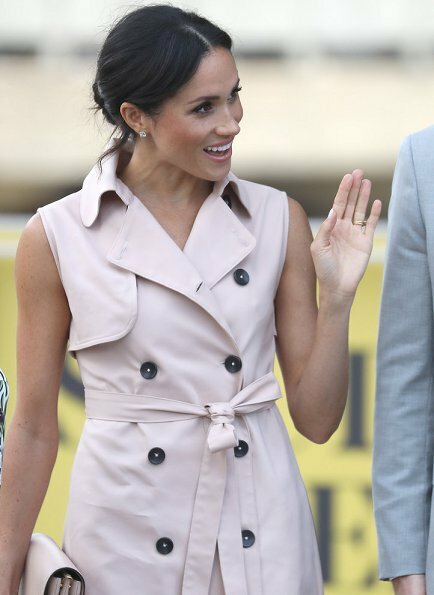 meghan is very elegant, and nothing absolutely wrong with this trench coat, shes not boring, shes not afraid to try new styles, shes taken leitizia/charlene way, you go meghan!!!!!!!!!!!!!!!!!!! I totally agree! Thank God she is doing it her own way. And this is the girl Harry fell in love with. It must pain him greatly to know how much criticism his wife gets because she does not fit into some outdated expectation of how a royal wife should look. Beautiful Meghan, she is perfect as she is. Love her outfits. There is nothing boring about her. I'm sure she will grow bit by bit and become a real asset to the Royal House. Megan is first and foremost Megan. What defines her is NOT that she is Harry's wife. She never dresses inappropriately and yes, has her won style. Including hair style. I truly hope she stays who she is. The person whom Harry loves and makes him so obviously happy, whom the queen has clearly "adopted" as her own granddaughter. A wonderful soul and a courageous, militant, carrying person. There are no "rules" that anyone really cares for - just those who haven some free time to kill and spend it on reading tabloids. Perhaps try supporting a charity like Megan instead? No offense meant. 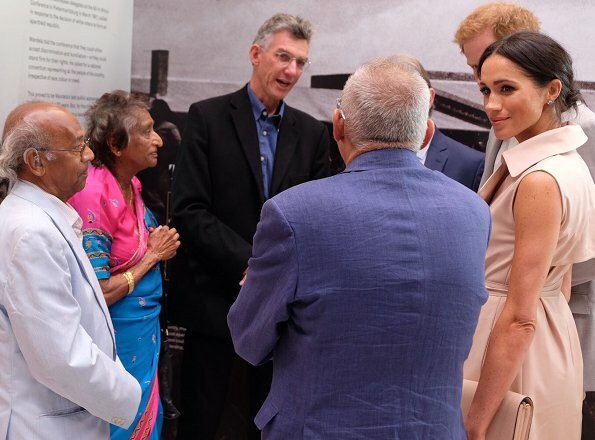 Then no one could make money selling tabloids and Mr Markle wouldn't be able to sell those pitiful comments. The moment we mention his name - he wins. LAst time I do it.